Karawang (Indonesia) —The 2016 MotoGP World Champion, Marc Marquez, and teammate Dani Pedrosa, together with HRC Director – General Manager Race Operations Management Division Tetsuhiro Kuwata and Team Principal Livio Suppo, visited the PT Astra Honda Motor (AHM) factory and two Honda dealers to greet and show their appreciation to the thousands of AHM employees who dedicate their time to producing Honda motorcycles for customers. Also on hand were Honda sales associates who serve customers in dealers. The two Honda MotoGP riders enjoyed their time with AHM employees in the AHM Karawang Plant, West Java, on February 2. They also visited the high-tech production facilities that are utilised for manufacturing the all-new Honda CBR250RR sport bike. Marc and Dani also met with thousands of AHM employees and expressed their appreciation. Called the Supersport Line, the assembly line for the CBR250RR is specially designed by AHM and features a Clean Room Assembly System to achieve manufacturing accuracy of engine and motorcycle components. Never before applied, this new manufacturing technology ensures the production process complies with standards. An Interlock System enables precise torque tightening during assembly of the CBR250RR, and Pick to Light System torque technology ensures components at each station work accurately based on standards. Besides visiting the CBR250RR production facilities, Marc and Dani greeted the Honda motorcycle sales and aftersales associates at two dealers: Astra Motor Jakarta in Dewi Sartika, Jakarta and PT Wahana Makmur Sejati in Gunung Sahari, Jakarta. 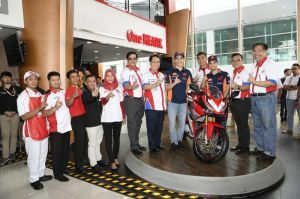 The riders also met Honda customers at both dealers. The Repsol Honda men will remain in Indonesia for the official Team Launch to take place tomorrow February 3 in Jakarta.